This brand new purpose built multi-deck car park is minutes from Sydney airport and serves all terminals. The Rooftop (deck 5) option offers a special low price, at just $15 per day this is incredible value. Limited space is available on the rooftop so book early to avoid disappointment. With excellent security including a 24 hour reception, an automated barrier system and CCTV its the safest place to leave your car whilst you're away. The friendly and courteous staff will look after you and the free shuttle bus runs up to every 30 minutes. The buses are all brand new, modern and comfortable inside. The friendly knowledgeable driver will make great conversation ! Book on-line for this fantastic low price which is only available for a limited amount of time. Once its full.... its full! Please note that occasionally the rooftop will be full and no longer on sale, however if the car park accidentally over-book you may be upgraded to a lower level free of charge. Please bring your booking confirmation with you to the car park on your day of departure. Please note the car park address before you head to the airport - 289 King Street, Mascot NSW 2020. This rooftop option is outdoors (on the roof deck of the car park). When you arrive, please take a ticket from the barrier ticket machine. Do not tap or insert your credit card. Car seats for infants are provided on request. On arrival, please take a ticket from the barrier ticket machine. Do not tap or insert your credit card. The barrier will lift and then please drive in. Park your car in the first available parking space then along with your luggage make your way to reception on the ground floor. Its important to take your car park entry ticket with you. At the ground floor reception present your reservation confirmation email and the car park entry ticket to the staff. You will check-in, show your booking confirmation, and then the staff will help you with your luggage on to the luxury modern shuttle bus. Reception staff will then provide a car park exit ticket for you to use on your return. The free shuttle bus will drop you at your terminal in minutes. Shuttle bus service to the domestic and international airports is complimentary for Looking4.com customers. Shuttle service runs from 4am-11.30pm, 7 days a week and leaves in 30 minute intervals. 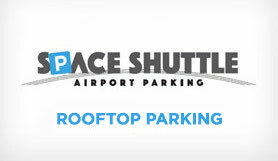 Once you have collected your luggage, head to the Shuttle Van Pick up area. For extra convenience, you can call the car park reception to notify them, and they will ensure the shuttle van is well on its way.